Yellow diamonds are found in quite a range of colours from the palest of yellows, right through to a very intense lemony yellow. The colour of a Fancy Yellow Diamond is partly due to the diamond’s body colour. However, of more influence is the cut type. The decision on what to cut will greatly affect the look of the diamond. If not chosen wisely, this may affect the cost and value of the diamond. Yellow diamond engagement rings are a beautiful choice and not as commonly seen as white diamond engagement rings. Cushion and Radiant cut shapes tend to refract more of the yellow colour tones inside a diamond. This increases the level of colour within the diamond and so improves the grade, as the more yellow a diamond is, the higher its grade and the greater the price that can be charged for it. 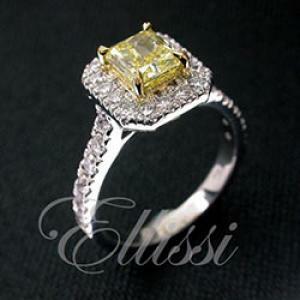 It is for this reason that most yellow diamonds tend to be cut into cushion and radiant cuts. The effect of cut enhancing the yellow tones is less so in other cut shapes, so although other cut types are available, their supply is more limited. Because they are rarely cut in yellow diamonds, cut types like the round brilliant are quite costly compared to the radiant or cushion cut options. In the high intensity grades like “fancy vivid”, all diamonds command premium prices. In comparison, light to medium yellow diamonds are often very well priced, and they are also very beautiful gemstones. Of course, whatever the colour, the beauty of the stone is still very dependent on the cut and just how good an example it is. One other very critical factor in diamonds of this colour, is luster. It doesn’t matter how yellow the diamond is, if it doesn’t have great luster, it will not have the beautiful, bright, sparkly over-all look that we want in a diamond. As always, great diamond selection is critical. If you would like a unique ring that will stand out from the crowd, it may be worth having a look at some yellow diamond engagement rings. “Amber” light yellow round briliant cut diamond ring. “Flaxen” Yellow diamond trilogy ring.